How about some neon glitter to go with that previous purple I was wearing? This is Hang Ten from Sweet Heart Polish. 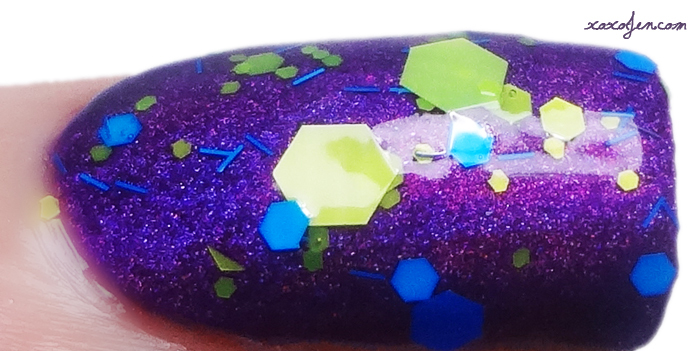 This matte glitter topper was part of the summer collection, and is now retired. I love purple, but I also love lime and turquoise with it, so this just had to be done! I wore two coats of the glitter topper and had no issues. What's on the nail is how it all landed with one brush dip each time I applied some. Such a pretty topper and I love the tiny bars and hearts in it! You can find other beautiful Sweet Heart Polishes at the Etsy shop and follow the brand on facebook! 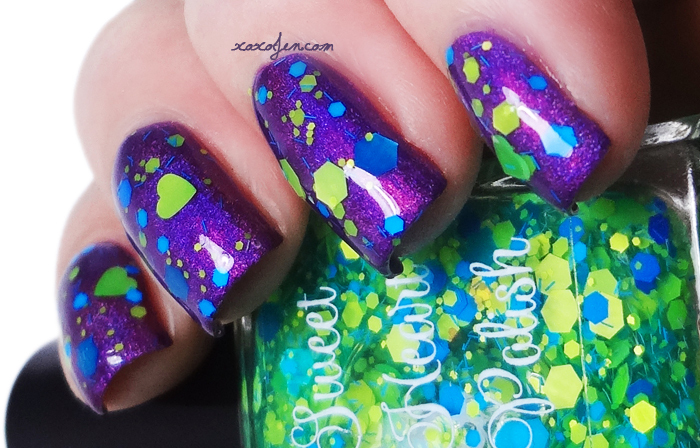 What is your favorite Sweet Heart Polish color? What a fun mix of glitters this is. I like how bright they are too. Don't they just pop over that purple?